Is your cat stressed out? Domestic cats have evolved in such a way that they handle short term stress very well, but have a much harder time dealing with chronic or "long- term" stress. Their ability to cope with stress can be influenced by their genetics or by environmental factors and learned behaviors. Bottom line-Cats DO NOT like changes! Whether it is a change in your family’s schedule, a new pet coming into the home, a loss of a pet companion or even rearranging the furniture can cause stress. If your cat is sick, this can make them feel vulnerable and anxious. Older cats will be even more prone to the effects of stress. Cats that are stressed might exhibit behavioral changes (such as missing the litter box) or stress related health issues. Fortunately, holistic care can help. 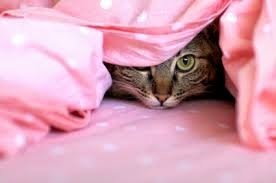 Here is an indepth article " 3 Steps of Cat & Dog Urinary Tract Infection Treatment" If your pet suffers from stress induced UTIs the best holistic supplements to add are Psystabil, Pet UTI Prevention, Akutur, and Power Probiotic for Pets Pet owners have had great results using these products and many kitties really do seem to feel a lot more comfortable on a daily basis!